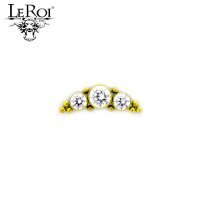 Part of LeRoi's Haute Couture Bijoux collection, this gem cluster is machined from ASTM F-136 implant grade Titanium and features three bezel-set gems and 10 bead accents. The center gem is 4mm, the side gems are 3mm. The thread is attached to the center gem. The titanium bezel setting and the bead accents can be color anodized. This gem cluster will fit 18 gauge, 16 gauge, 14 gauge and 12 gauge internally threaded posts.